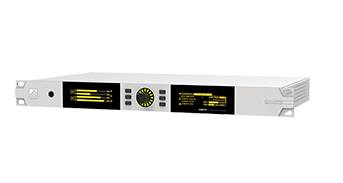 Our first incarnation of the RBRX went on to solve thousands of weak signal issues at crowded transmission sites around the globe setting a new standard for rebroadcast receiver technology. During the last 8 years, whilst the industry’s been playing catch up, we’ve been busy improving on this legendary product - and RBRX Encore is the result. 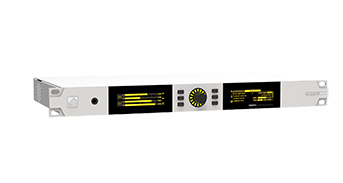 Housing two of the world's most selective and highly sensitive tuners, coupled with the most advanced signal processing capabilities, RBRX Encore is the new pinnacle of rebroadcasting performance. Offer full diversity reception from both antenna inputs. With advanced anti-aliased protection distortion control. 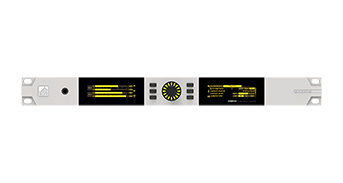 Automatically revert to audio inputs or on-board memory, keeping your re-broadcast on air. Prevent jamming and hijacking of your relay by only transmitting a signal with the correct PI code. Automatically adjust parameters on the fly and get email alerts as it happens. With two DSP tuners as standard, the RBRX Encore can continuously monitor readings from two separate sources. With it's unique 'diversity' system, it can compare these inputs in real-time, and where necessary, instantaneously and inaudibly crossfade between them, so it’s always working with the best available signal. As a company with deep roots in audio processing, we’ve utilized decades of experience to include an enhanced DSP audio limiter and stereo generator, as well as user control over dozens of audio & RF settings such as de-emphasis, stereo blending, and IF bandwidths. The RBRX Encore can also deliver extremely clean and reconstructed composite outputs to feed your translator or rebroadcast installation directly. With PlanB silence detection and source switching as standard, RBRX Encore can automatically revert to auxiliary sources or onboard flash memory if signal problems arise, keeping you on-air at all times. Our latest remote control and monitoring software allows you to interact with your processor from anywhere in the world and even listen in over an IP connection in real-time. Our all new intuitive alarms and events system allows you to assign intelligent actions to any rear panel (digital or analog) GPIO level event. Take complete control over each alert by mapping it to a set of ‘do this when’ and ’do this now’ actions for the most versatile and customizable alert configuration possible. To really get a feel of the countless features of this unit, please download the datasheet, or better yet, request a demo from your local dealer. You will be surprised how well this unit pulls in, rebuilds and re-broadcasts your signal.